I have always found that the best way to get a cheap flight is by not having too many stipulations. By this I mean not having specific dates and times, preferred local airports, destinations and airlines. There are many factors that determine how much you pay for your flight at any one time and one of the biggest factors is demand. In short, the more flexible you are, the better the deal you will find when booking flights! Just like anything else, the price of a flight is determined by how many people actually want to fly to a certain destination on a specific date. As you can imagine, peak periods such as school holidays, bank holidays, Christmas and New Year will all increase demand and in return, command a higher price. Also, special events in major cities such as football matches, concerts, marathons, parades, festivals etc. will all contribute to increasing the demand and final price of a flight. There are many other factors that you need to take into consideration when trying to find a cheap flight, that will help reduce the cost and help you find the best deal. Be Flexible: Being flexible with your dates, times, airports, destinations and airlines will make a huge difference to the cost of your flight. A day either side of your original travel date could mean you saving a large amount of money. If you can’t be flexible on your dates because of school holidays etc. then try to be flexible on your destination. Only Search For One Passenger At A Time: When you are searching for flights, always do a search for one passenger, even if there are several people travelling in your group. This is because even if the airline has one seat left at a lower price and you type in a search for two or more people, they will not offer you the lower price seat. Instead, they will actually offer you two or more seats at the higher price. The best policy is to do a search for one person at first and then book the seat at the lower price if it is cheaper that it would be when booking flihts for to or more people. Then, once you have book the flight at the cheaper price, do another search and then book the other(s) at the higher price. You can then share the total price between your group and it will work out cheaper than booking all the flights at the higher price! Check Both Low Cost And Major Airlines: Don’t just presume that the low cost airlines are the cheapest. Yes, if you manage to get in early and are only travelling with hand luggage they are hard to beat on price. However, with the low cost airlines the price increases the later you leave it and sometimes the major airlines and travel companies reduce their prices closer to the date of travel, especially if the seats are not selling. These flights often include taxes, hold luggage and meals which can often be a mch better deal when booking flights through them. Shop Around: Never book the first flight you see, always check several other airlines before you commit to booking flights with an one airline or travel company. Using one of the flight comparison websites that search all the airlines will make the task much easier. To learn more about flight comparison websites, please read the following article: Flight Comparison Websites. Know How Much You Want To Pay And When To Buy: Airfares fluctuate and although we all want to pay the lowest amount possible for our flights, sometimes waiting for the prices to drop even lower can backfire and only results in them increasing. I fully hold my hands up to having done this on more than one occasion! Knowing a price that you are happy to pay and not what you would like to pay can save you from this pitfall. If you see a flight that you are more than happy paying the price for, BOOK IT! Don’t Forget The Added Extras: Although a flight might look cheap initially, you might be surprised at the final cost once you get to the check out. Don’t forget that many airlines now add on taxes, baggage, meals and administration charges and these are all costs you should take into account when booking flights. Be Prepared To Fly From A Different Airport: We all have our first choice airport which is the closest to our home town but sometimes it can work out much cheaper to fly from a different airport that is a little further away. This can be a significant saving if you are travelling in a large group where the cost of car parking or taxis can be shared. However, always ensure to factor in how much money you will actually save by flying from a different airport once you have driven and parked your car, as sometimes it is not worth the extra distance just to save a few pounds. airports keeps their costs down, as the charges to land at these airports are cheaper. 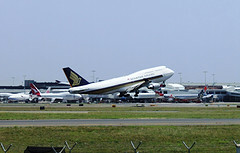 Although they may be a little further from the cities, these airports that are serviced by the low cost airlines generally have a good ground support network in place, that connect passengers to and from the cities. Fly Mid Week: Mid week flights are generally cheaper than weekend flights. Book Your Flights In the Week: Avoid booking flights at the weekend. many airlines incree the price of their flights over the weekend and then reduce them again Monday morning. the airport in the early hours of the morning or late at night, especially if you have a family with children. However, if you are happy to do so, you will find you have a much wider choice of cheaper flights. Fly Low Season: As we discussed earlier, there are certain times of the year when flights will be much higher priced, if you can avoid these peaktimes, the price will drop significantly. Look Out For The Discounts: Many airlines offer discounts throughout the year and if you can keep your eye out for them, you can save even more money when booking flights. (Get to know about these discount codes through our FREE services). see is the price you pay. See our Mix & Match page for these flights. Don’t Pay Credit Card Charges: Credit card charges annoy everyone and there are certain credit cards that do not carry any charges to use. Check with the airlines which credit cards they accept that you will not be charged to use. Book Well In Advance: Many of the low cost airlines work on the ethos that you pay less the sooner you book your flights. Yes, there may be times when the price of the flight drops but as we said earlier, if you got the flight at a price you were happy paying, there is no real loss. Try to book your flights well in advance rather than trying to buy your flight a week or a couple of days before travel. The low cost airlines know that most people who are booking flights at the last minute are either businesses or people who are desperate to reach a destination quickly and as a result, will pay high prices. Frequent Flyer Programs: Many airlines have their own rewards schemes and offer discounts, free upgrades and also free flights to their members. No matter how many times you fly throughout the year, it does no harm to register for these programs as most are FREE. Above are just a few simple things that you can do before travel to help you find the best deals on your flights. Now visit the following page How To Find Cheap Flights and put them into practice. Hopefully, the above information will be beneficial when you are booking flights in the future.